This is important. Very important. In one of our Story Circles Narrative Training sessions recently a scientist was presenting his ABT about herbivory in rain forests starting off with basically, “The climate is changing and in rain forests we are seeing …” This is one of the fundamental communications mistakes being made by the science and environmental community — the assumption that climate change is “the new normal” — that everybody knows about it now. No, they don’t. My advice: think through what the “ordinary world” means, realize most of the public is still grasping what climate change means, then start your narrative in the pre-climate change world. Climate change is the central “problem” now. To assume everyone has already advanced to that stage runs the risk of losing a lot of people, as well as coming off as aloof. WHAT MAKES A HERO? This is from Matthew Winkler’s excellent TED ED video of 2012 that everyone should watch a few million times. Yes, it may feel like it’s “too Hollywood” if you’re a scientist, but make no mistake, your entire life is about problem/solution which involves the journey from the “ordinary world” (you have no problem) to the “special world” (you are seeking a solution) then back to the ordinary world when you’ve solved the problem. A crucial aspect of this for communication is to be sure you’re starting in the right ordinary world. It’s not that simple. I don’t care if you pride yourself on being “a quick study.” You’re missing the point — it’s about building narrative intuition, which takes time. But for the sake of discussion and because this is a fairly profound element, I’m going to share this one bit that we’ve encountered in Story Circles. 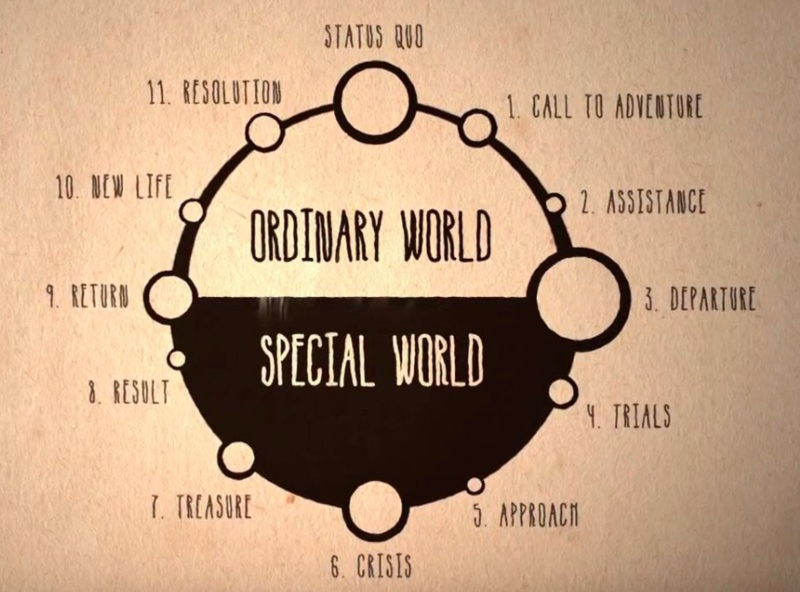 WHAT IS THE ORDINARY WORLD? This is a question that my buddy Mike Strauss, head of the Office of Scientific Quality Review for the U.S. Department of Agriculture’s Agricultural Research Service (ARS) has locked onto a lot in our training. He has now overseen 5 Story Circles at USDA, including the prototype that produced the effusive testimony of participants a year later that I told of in July. He has taken to stopping a lot of people as they are working on their narratives and asking them to think through and clearly define the “ordinary world” of their project. If you’re not familiar with this term you can get a good first introduction with Matthew Winkler’s excellent TED ED film. This is the whole dynamic you get with Story Circles — other people poking and prodding your narrative, helping you develop it as clearly and strongly as possible, ideally before you even start writing much of anything. Everyone should stop and ask themselves this question for any project — what is the ordinary world — the conditions before the problem is identified. Describing the ordinary world is where you lay out elements of agreement — things that everyone in your audience knows. And this is where a lot of climate communication is making a mistake. I moderated a panel on climate change for the Malibu Public Library Speaker Series last month. We had 3 climate experts and 200 audience members, almost none of whom had any background in climate science. Most didn’t have the first clue of what climate change really means. But even for the people who are climate experts. It doesn’t hurt to open with a tiny bit of historical review — that once upon a time our climate wasn’t changing this rapidly. We can all agree on that, and agreement is where you want to begin. This is a tough dynamic because so many people want to begin by impressing you with how much they know. It often takes a true expert to feel comfortable enough starting slowly, but it’s essential for communication to work well. And in the meanwhile, Story Circles is so amazing — we learn something new with every circle we launch — like the one we started this week at Tufts University with five faculty members. It is our 12th circle so far. Lots more to come.